If you read my previous Myanmar post, you'll know the 60km from Kalaw to Inle left me feeling pretty pooped. Don't get me wrong, it was hardly an extraordinary feat of human exertion, but for someone who has bummed around on a sun lounger for two months it was pretty labour intensive. So when we arrived in Inle we were ready to chill the F out. And that, we did. We booked - before the trek - a double room in the Thanakha Inle Hotel. It wasn't cheap at £52 a night (May 2016) but it was oh-so-perfect! When we arrived in our huge, clean, minimalist room I think I shed a little tear... I was so ready for comfort at a time when my legs were failing me! I spent a good 20 minutes in the steaming hot power shower (a rarity in Myanmar when we were visiting) before changing in to clean clothes and getting in to bed, where we downloaded a film and chilled out. The inclusive breakfast was impressive, and the restaurant overlooking the river sorted us out on the first night when we couldn't begin to think about venturing out of the hotel. It was just what we needed! It's important that you book your hotel before starting your trek, as the trekking company will transport your luggage to the hotel for you. Ours was waiting for us in our room on arrival! The main attraction is, of course, the lake. We paid 18,000 kyat for a day's boat trip with driver - around £10 - who we found after asking a few boat guys in town and haggling for a good price. The hotel's offerings were far more expensive, as they usually are. Be prepared to look around and haggle for a price you're happy with. Usually, if you go with a group of people you will get a better deal as you can share the cost between you. I would suggest that if you can afford to, then get a private boat (as we did) as you then have more flexibility as to what you see, and you can miss out some of the really touristy spots. 'Cos one of the downsides is that it is fairly commercialised - the boat drivers go to (mostly) the same spots, where they have various handicraft centres. We saw silk and lotus weaving, a silver workshop and umbrella making amongst others - yes, it does get a bit tiresome! At one of the stops there were a group of karen women - the longneck tribe - who we chatted with (they had basic but alright English skills!) briefly, but left feeling a little uncomfortable as ultimately they were there as the 'freakshow' attraction. It felt this way, at least. Although it might have succumbed to tourism, it is undeniable that the lake is stunning. Once you get out in to the lake proper, it is just so peaceful. We didn't see a whole load of boats when we were out and about - just mostly at the handicraft centres - and it felt at times like it was just us out on the lake with the fishermen. A note on the fishermen: some of them are fake. I kid you not! The image above is one such fake fishermen; they dress up in the 'authentic' attire and the boat men take you out to them for photo opportunities. I heard that some of them ask tourists for money, but we didn't experience that. We went passed, took some pictures, and then when we looked back and he was back sat down on his boat eating nuts! It really was hilarious. The real fishermen sadly just wear normal clothes, but you can see them trawling for fish with huge nets which they skillfully cast out across the lake. Our boat trip started at 9am and we were done by around 4pm - so quite a long day! Be sure to take suncream and a hat (if you have one which will stay on!) as it gets pretty hot out there. The boats are decked out with little chairs that allow you to sit upright, meaning it's not too uncomfortable. Lots of tourists hire bicycles in Nyaungshwe (the town next to Inle Lake), as it's fairly small but has proper roads that make cycling easy. We did just that and spent a day cycling round the town and out to various spots on the outskirts. 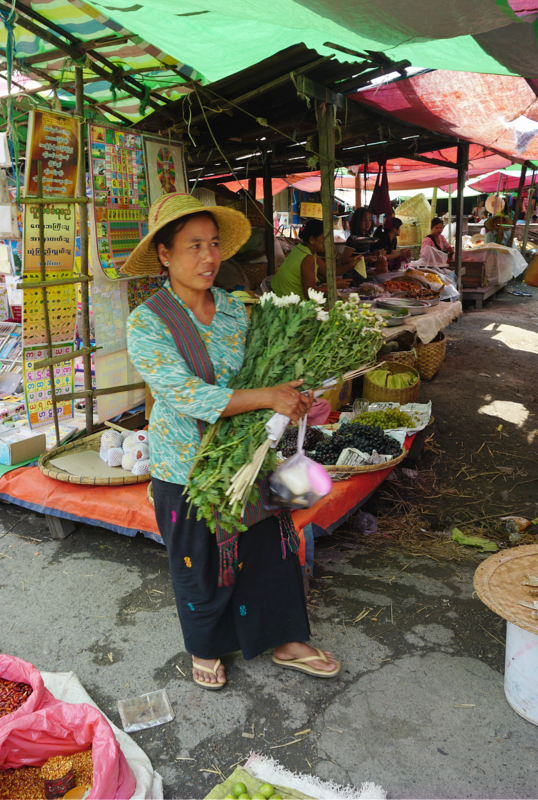 The town has a rotating market which is well worth a visit, purely to see locals going about their daily lives - a great location if you're in to photography. Live Dim Sum House - does was it says on the tin! We didn't find Burmese food that inspiring, so it was nice to have a change. The prawn dim sum were dreamy, and pretty cheap. Lin Htett - this place was in the Lonely Planet guide, I think, but is a good place to get a drink and watch the world go buy. They will bring you out cakes which you can take if you fancy, but if not they will just take them back - no pressure to eat them all! No alcohol, as it's a Muslim tea shop. The French Touch - a fairly Westernised spot which we went to a couple of times for drinks. One Own Grill - a great lunch spot with a mix of local and Western dishes. Everest Nepali Food - super cheap curries, the thali dishes were good if you want to try a bit of everything! When we went, Inle / Nyaungshwe was pretty 'local' still - there were a handful of touristy spots but it still felt fairly untouched. Yes, there were loads of hotels and hostels, but other than that it wasn't hugely developed. I'd be really interested to see it now! The lake is just so beautiful, and I know that it is one of those places that everyone who visits Myanmar checks out, so I'm sure it will become more developed with time. If you go - tag me in your Instagram posts so I can see!